Traditionally, native women held positions highly revered in their communities, often respected as leaders, warriors and always as the bringers of life. However, after first contact, non-native men frequently viewed indigenous women as disposable sexual commodities. Based on today’s disproportionately higher rate of violence toward native women and a judicial reluctance to prosecute these crimes, it is a belief that appears to be ongoing. native women are murdered at more than ten times the national average; and U.S. attorneys declined to prosecute 67% of sexual abuse related cases. In Canada, a 2015 report by the Royal Canadian Mounted Police (RMCP) concluded 1,049 aboriginal women had been slain between 1980 and 2015, and that another 175 were considered missing. Patty Hajdu, Canadian Minister for the Status of Women, reported in 2017 that 4,000 would be a more realistic number based on a history of police under-reporting or failure to properly investigate cases. The Canadian Broadcasting Corporation (CBC) reports that activists with the Walk 4 Justice initiative collected at least 4,232 names of missing or murdered indigenous women. Although the numbers tell a story, revealing a tragic disparity that must be rectified, we must remember the persons behind the numbers. This Cherokee style single-weave basket was created not only to point to the statistics but also to humanize women who’ve lost their lives. Woven in the traditional pattern called “Water”, the vertical splints are printed with high stats of violence directed at native women in the U.S.; the horizontal splints compile the discrepancy in gathering such numbers in Canada. The interior is printed with the names and tribes, compiled by the CBC, of 306 murdered and missing women, cases the RCMP dismissed as solved. The families of these women dispute this resolution. The Red River, which runs from Winnipeg, Canada to northern South Dakota, has become known as a place where the bodies of women are regularly recovered making its name (Red River) heartbreakingly fitting. 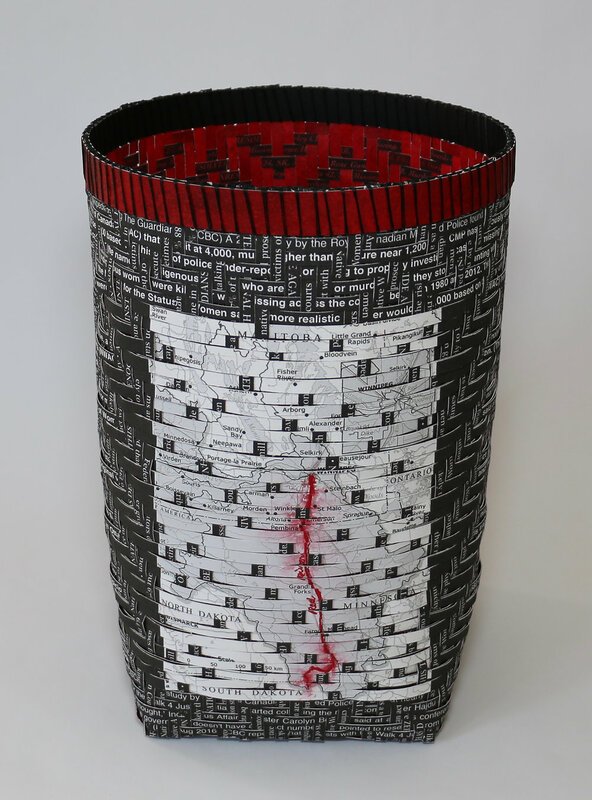 Included on the front of the basket is a red-lined map of this river, a visual gash to serve as a reminder of this place where native women have been discarded and seemingly forgotten. It is time to recognize the humanity of these women, mourn the value of their lives and put a stop to this terror.